Lip Plumpers - Should You Use Them To Puff Up Your Pout? ‘Lip Plumpers’ – Should You Use Them To Puff Up Your Pout? Our lips are like a ‘sponge’. The more you expose them to moisture, the more they absorb it and get plumped up. But if you neglect those little babies, they dry out and look miserable. While you can always slather a layer of petroleum jelly on your lips in order to up the moisture game, there is another choice called ‘lip plumper’ that has also been trending in the makeup world. If you are not comfy with cosmetic surgeries still want to get a pair of fuller and juicier lips instantly, lip plumpers are yours. But what is the actual secret of these products? Do they really show positive results without endangering your lips? Let us discover here. Lip plumpers are transparent or tinted lip products available as gel, balm, or gloss, and can be used for the temporary enhancement of lips. It is said that most of these products contain natural components, which give us bee-stung, perfectly kissable lips by plumping it up. The ingredient lists of lip plumpers usually contain cinnamon oil, capsaicin, ginger, mint, hyaluronic acid, alpha-hydroxy acids, wintergreen, retinol, etc. Some of these components are known to fatten our lips by irritating them, while others cause a little puffiness as well as flush by boosting the flow of blood through them. However, it has been found that the usage of lip plumpers results into an uncomfortable stinging or burning sensation while adding an extra shine to our pout. All these cumulatively make our lips look plump. How To Apply Lip Plumpers? Choose a lip liner having a shade nearer to your natural lip color and line your natural lip line with it without going overboard. Pick your favorite lip plumping gloss and dab it right on the middle of your lower lip. Press your lips together so that the gloss gets spread all over your lips and make them look fuller. 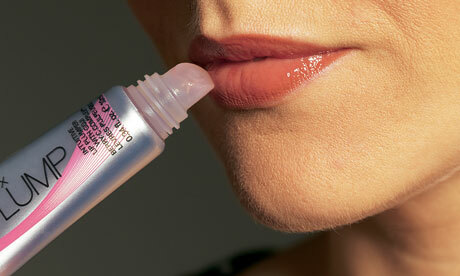 Lip plumpers comprising ingredients, such as cinnamon oil usually work by irritating our lips. They cause a tingling sensation and a considerable swelling, which eventually make the lips appear ‘fleshier’. Even though this way of working seems to be harsh, the extent of irritation is actually mild and it is also pretty safe. Certain lip plumping potions use the age-old idea of ‘stimulating blood for swelling up’. While plumping other parts of the body need different ingredients, they work essentially in the same way. The presence of capsaicin, menthol, etc, in lip plumpers can lead to an instant blood rush to our pout. Hence, we get plump lips easily. Some lip plumpers work via ‘vasodilation’ in which the smooth muscle cells within the walls of blood vessels contract and expand naturally. These products are rich in caffeine as well as vitamin B3, which facilitate the widening of the blood vessels in our lips. This effect of vasodilatation increases the flow of blood through the lips and makes them look fuller with a significantly plumped-up appearance. Finally, there are some lip plumpers, which follow an ‘inward approach’ to plumping in an innovative way. They contain ‘biological additives’, such as collagen, atelocollagen, tripeptide blend, and hyaluronic acid, which work as ‘cell-boosting molecules’ and improve the overall health and texture of the lips simultaneously. You can promote the growth and functionality of your lip cells by using such lip plumpers, thereby getting fuller and fatter lips over time. They also hydrate and rejuvenate lips while working to erase wrinkles and fine lines. However, these additives are often extracted from animals. So, if you are a vegan, you may want to stay away from these. The thick, glossy formula of a lip plumping serum adds heavily to its plumping effect. It not only plumps up the pucker but also makes the finishing ‘ultra spectacular’. There are quite a few lip plumpers that possess therapeutic benefits and hence, are used as treatment products for lips that need a little more volume. The major ingredients of such items include marine collagen, peptides, and even certain human growth hormone, which can stimulate the secretion of collagen and elastin in our body significantly and make our lips juicier and sexier internally. They might also contain hyaluronic acids for holding the natural moisture of our lips and making them appear attractive. Should You Use Lip Plumpers? Lip plumpers are indeed that ‘pick-me-up solution’ for most of us who have neither voluminous lips nor the courage of undergoing surgery. But no matter how much devoted you are to your stuff, that ‘Kardashian-esque’ lip amplitude can cost you highly burning sensation and extreme discomfort. So, using it every day is really NOT okay! Also, make sure that you do not overuse it. It’s true that when it comes to getting plump lips, nothing can be easier than lip plumpers. You can save hundreds of thousands of bucks by plumping up your lips with such ‘wonder-working serums’ and get almost instant results. However, their effects are not very strong. You can expect the effects of your favorite lip plumper to last for only a few hours. On the other hand, the secrets behind most of these commercial lip plumpers are natural ingredients that we can easily find in our kitchen. We have already mentioned how spicy extracts (hot pepper or ‘capsaicin’, cinnamon, etc. ), mint, ginger oil, caffeine, menthol or menthol derivatives, etc. are being added by companies to their lip plumping formulae in order to yield surprising results. Hence, you can simply choose any of them and apply it directly for a swollen look that lasts. Take good care of your lips. Pamper it daily with a luscious lip balm rich in lots of hydrating natural ingredients. Choose the shade of your lip color wisely. Dark shades can make your lips look smaller while lighter and neutral shades make them appear fuller and fatter.